I am old enough to remember the 90s X-Men cartoon, which set a pretty high standard for cartoons at the time. First, there was nothing like it, as many of the cartoons on TV at the time pretty much were purely entertainment. Gone were the days of Silverhawks and Robotech, where you could learn something from a cartoon. This is exactly why the X-Men were an anomaly, as they had mature themes, but understood the show was for children. This was before the world fell in love with Wolverine, as the Brian Singer movies had a lot to boost his popularity as well as Hugh Jackman, for many kids, if they did not read the comic, this was their first introduction. Here we found a character, who was really a loner and all about business, something Jackman has conveyed in spades, but this show did it first, and much more convincingly. The best part of the show, is when they found new mutants, where the audience got to meet someone new with powers. In this issue of The 99, the reader gets that, as we are introduced to a few new carriers of the Noor stones. Dr. Razem, at the beginning of the issue, continues to find wielders of the gemstones, as one by one, finds their power. We are introduced to Kyai, Amira, Hatem, and Rafie, each seemingly ordinary but each quite unique and powerful. We find out how each, gets to know their power and some even save some lives. By issue’s end, Razem, has found a few new recruits, each willing to fight for good. Overall, probably the best of the issues thus far I have read, proving that great stories come from all over the world. The story by Fabian Nicieza is exciting and hard hitting. The art by Ron Wagner is gorgeous. Altogether, a fun collection of origin stories that will introduce the world to a new set of heroes. Genre television has been around for decades, but the gap in quality has only gotten better in the last few years. I remember as a kid growing up, watching Adam West’s Batman, on the television, just about every afternoon. It was fun watching the Dark Knight, before he was so dark, he was all business, but family friendly. I also remember watching the Incredible Hulk, a much sedate heartfelt version not only the big Green guy also of Bruce Banner. As both of these examples still hold a special place in most fans hearts, it is hard for most of those fans to see how unfaithful these shows were to canon of both of these characters. In recent years, a lot of these characters including the Dark Knight, a la Gotham, has their stories told much more in step with what is canon. This why I am pretty obsessed with The Gifted, as this shows a world after the X-Men, and is pretty close to how the world is, as it was portrayed in X men: Days of Future Past. This is what this particular issue of The 99 reminds me of, entitled Futures. As the team gets caught up in a trap, Hadya, The Guide, gets seriously injured, Dr.Hamzi, becomes desperate to know what lies ahead. He summons Aleem The All Knowing, to soothsay all the possible futures the team may encounter. As each future is revealed, one direr than the other, and each could be changed with one decision. By book’s end, each team member sees as long as every decision counts. Overall, a great issue in the series, a mix of Quantum Leap and Sliders. The story by Naif Al-Mutawa and Stuart Moore is funny, and action packed. The art by Joe Rubinstein and Ron Wagner is beautiful. Altogether, a great book, that lets the world see POC characters in spaces that they would otherwise not been seen. Hari Kondabolu recently made a documentary about one of the world ‘s recognizable, as well as its most stereotypical characters ever in animation, Apu. The very fact that the character is not voiced by someone of Indian decent, is a tradition, that goes back as old as the artform itself. As some people know that the character of Cleveland Brown on Family Guy is not voiced by an African American actor. The difference between Cleveland and Apu is not that one is more problematic than the other, but it is a matter of quantity. In Kondabolu’s documentary, “The Problem with Apu,” most the interview subjects who grew up in America, expose the world to what most to of us know, Apu is not representative of any experience by any South Asian American. He also exposes, a systemic issue, one where every South Asian American, growing up, is identified with this character, one where the actor himself, refuses to even be interviewed for. The movie drives home that representation matters and that applies to all art forms. So, when I heard a bout a few years back, of The 99, I was intrigued to read this book about Muslim superheroes. We are introduced to Dr. Ramzi Razem, who as a child discovered the Noor Stones, and the power they held, while visiting Spain. Years later, he became obsessed with finding al 99 of them, which were spread across the globe, and just each stone carried a unique power, it required a unique individual to possess it and wield its power. The reader gets to find out how each member of the 99 comes to find their own stone, and how they found their synergy with it. By book’s end, Razem, has assembled an awesome fighting force, that has to be ready for the war that is coming. Overall, a great book that shows diversity matters and that great stories can come form anywhere in the world. The story by Naif Al-Mutawa and Stuart Moore is intricate, adventurous, and fun. The art by June Brigman, Albert Deschesne, Monica Kubina, Roy Richardson, and Dan Panosian is gorgeous. Altogether, a great book to a new universe that looks like the world. It was new comic book day yesterday! What did everyone get? The Beat – San Diego Comic-Con parking goes to lottery system – So glad I don’t drive. The Independent – The All-Islamic super-heroes: Muslim children love ‘The 99’ comics, but hardliners loathe their creator – whose trial for heresy is looming – Ugh. iO9 – The Secret History Of Marvel’s Movies Before Iron Man: Part 1 – Some good history here. The below is reprinted with permission by Dr. Naif Al-Mutawa, the creator of the series The 99. The series helps present modern, constructive roles for youth in the Arab world. It’s a shining example of positive engagement. The below discusses some of the attacks he has received due to his creations including a Fatwa, charges of heresy, and death threats. We stand and support Naif, condemning the threats, we ask you to join in and do so as well. Many years ago, I was the volleyball counsellor at a summer camp in New England. It was 1990 and I was fit for five minutes. It seems there’s always an injury I can blame my (lack of) fitness on. That summer was no different. Running into the lake, I slipped. My hands instinctively shielded my face from hitting the lake bottom and my elbows jerked back and got caught in the sand, sending my right shoulder out of its socket. I popped it back in. It was painful. I had to rest for a week before seeing a doctor. And then, on the way to the clinic, I had a terrible car accident that meant I completed my journey to the hospital in an ambulance. I’ve had my share of car accidents. Two of them were not my fault. This was one of those. It involved being shunted by a Mack truck while I was stationary at a traffic light. At the hospital I was told that my shoulder had popped out again and that the boot of my car had been compressed to within inches of my head. I was lucky. It was there I met an ambulance chaser, which was a first. I got his card. I got his pitch. I told him there and then not to bother: if the lorry driver who had written off my car had money, I reasoned, he would have had brakes too. I also told him I did not want to live my life by taking something away from someone else. I wanted to create rather than destroy. I did not want to be associated with a bottom feeder. A few weeks later, a six-year-old boy sneaked up on me while I was brushing my teeth and said: “You don’t have a country … you don’t have a country …” A fellow counsellor who had roughly the same intellect as the young boy was hiding behind a tree. He had put the child up to it. It was surreal. I called my father in Kuwait and he casually explained to me that Iraq’s invasion was a routine matter that would solve itself in a matter of days. It didn’t. The things fathers say. Now, many years later, I have spent the summer recovering from another painful injury (giving me another excuse to explain away why I’m still not fit). Last summer, as I was leaving my children’s summer camp in New England, I missed a step on an outdoor staircase and got my leg caught between a step and a tree root. I went in one direction and my leg in another. I broke my leg so badly my bones came out of my body for a breath of fresh air. My surgeon referred to my fracture as Humpty Dumpty. It took several surgeries and months of physical therapy to start to feel normal again. While I recovered, another bottom feeder made his way into my life, this time forcefully. A man whose view of reality is narrow and violent, sued me for heresy and went around submitting false accusations to various institutions asking for a fatwa on my work with THE 99, a super-hero cartoon series I created based on the 99 attributes of God. Sadly, the Grand Mufti of Saudi Arabia and the ministry of Islamic affairs in Kuwait did not do their homework and issued fatwas condemning THE 99 based on false accusations and misstatements provided by this ambulance chaser. This is after THE 99 had been broadcast daily for two years all over the world. The United Nations, the World Economic Forum, world leaders including president Barack Obama, the emir of Kuwait and many others endorsed my work for bridging cultures and tolerance. In fact, THE 99 has been approved by the ministries of information in Saudi Arabia and Kuwait and was funded by a Saudi Islamic Investment Bank with its own Sharia board. This accusation opened up a Pandora’s box and led to an avalanche of extremists each trying to outdo one another. It led to fatwas and more recently death threats from Twitter accounts linked to ISIL and Al Qaeda. You can imagine the call I had with my parents and my children when the front page of Kuwait’s leading daily newspaper quoted various death threats. Look on the bright side I told my parents. This shows the impact of THE 99. My son, who is a summer camp counsellor this year, called me in a state of panic. His friends told him I was dead or that I was going to jail. I tried to allay his fears by telling him it was routine. The things fathers say. Having released it on the heels of Desert Storm, Disney thought they could get away with the lyrics. They couldn’t. Protests led to changing the lyrics on the video and DVD versions. I was among the protesters. Last week I took my children to watch Aladdin the Musical on Broadway. And as I sat in the audience I couldn’t help wonder should those lyrics have been changed? Should I have protested against them? Isn’t someone trying to cut off my head because they don’t like the way I think? As I write this I am considering going to Kuwait to answer charges of heresy. The ministry of information has turned a number of production companies over to the public prosecutor for violating the audio-visual media law. May God bless Kuwait and may the forces of darkness not muffle innovation and creativity. And may the ministries start to understand that in the name of protecting our culture they are responsible for killing it by scaring off the content creators and the content investors. Why would anyone invest in media content if the producers can be sent off to the public prosecutor’s office and potentially serve jail time. Isn’t it just easier to keep dubbing Turkish, Mexican and American dramas? And if we keep doing that, aren’t we diluting our culture? And if we do, then whose fault is that? Perhaps the ministries were not set up to protect our culture after all. It’s new comic book day! What has everyone excited this week? The Beat – Broken legs, death threats and fatwas: the trials and tribulations of THE 99 – An important read. Dr. Nayef Al-Mutawa has 99 problems and ISIS is one. 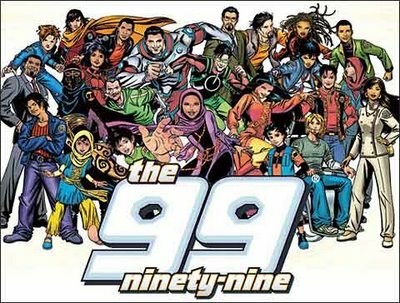 The creator of the comic/cartoon series The 99 has been deemed “slanderous to Islam” by the Islamic State of Iraq and Syria as well as Al-Qaeda. The terrorist group has taken to social media calling for the assassination of the creator. Al-Mutawa has defended the work, even going so far as receiving clearance from sharia scholars who said the comics do not insult Allah or Islam. The head of the Human Rights Basic Elements Society Dr Yousef Al-Sager stressed that such fatwas must be issued by courts because it is very dangerous to follow fatwas from such anonymous social media accounts. The comic was created to present a positive portrayal of Muslims, and provide Muslim children positive role models with each character embodying a pillar of the religion. In March, the series received a fatwa against it and in February the series was highlighted in a positive way by the United States’ State Department. When the series launched it was attacked by the right as a way to indoctrinate children into Islam among other claims. We hope Al-Mutawa remains safe and sound. Comics have had an interesting role in the Arab and Muslim world, often being used to express frustration with overtly restrictive governments, helping with revolution, or attempting to present a better spotlight on the Islamic faith and its Muslim worshipers. The Daily Beast has reported that Grand Mufti Abdulaziz al-Sheikh issued a fatwa – a legal opinion or advice from the Islamic faith – against the comic book and TV show The 99. The series featured characters who identify with the 99 names of Allah and have been the focus of controversy here in the United States. That’d be the exact opposite of what the point of the comic is. The comic has been praised by the United States, which has highlighted it numerous times. With the rise of positive Muslim characters like Marvel’s excellent new Ms. Marvel, it’ll be interesting to see if more fatwas are declared. Batman, Superman and… Jabbar the Powerful? These superheroes may have more in common than you think. Check out this webchat featuring David Glanzer, Director of Marketing for Comic-Con International, and Dr. Naif Al-Mutawa, exchange alumnus and creator of THE 99 — the world’s first superheroes based on Islamic culture and society. The U.S. Department of State has turned to digital diplomacy in the form of their Co.Nx web portal which features video, audio, Twitter and more. It’s a space for an “interactive exchange of ideas” like the above that brought together members of the State Department and some one of the creators of the Mulsim superhero team The 99.